This originates from Ireland's rugged Antrim coastline, home to the country's oldest working distillery, founded in 1608. This excellent whiskey is triple-distilled, showing fruity and spicy aromas with a delicate vanilla finish. 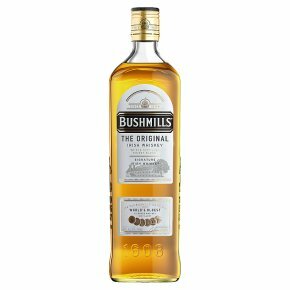 Bushmills Original is a blend of single malt Irish whiskey and Irish grain whiskey. Ireland's oldest whiskey distillery. Smooth & mellow. Award winning flavour and quality. Finest blended Irish whiskey. Triple distilled trademark. Bushmills signature blend.A special blend of Bushmills single malt whiskey distilled in copper pot stills combined with fine grain whiskey.